A section of Thala Ajith fans have been fuming in Twitter about actor and producer Udhayanidhi Stalin for his tweet presumed to be insulting Ajith. Few days ago, it was reported that Udhayanidhi Stalin had insulated Ajith on his twitter when a fan of Ajith had commented him on his twitter. This led to war of words between Udhayanidhi Stalin and Ajith fans in twitter. 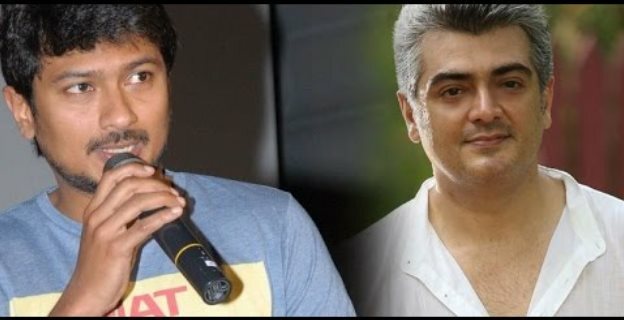 Udhay has however clarified that he has a huge respect for Thala and he has never intended to insult him by any means. He has also tweeted that, the news, which spreads like a forest fire is entirely fake and he also angrily said to stop the rubbish and not to interrupt a good relation between two actors. Here is the clarification from the 'Nanbenda' actor regarding this in his twitter page. The news that I insulted Thala Ajith sir in Twitter is just rubbish! I have great respect towards him! Pls stop spreading false news!